When early man decided to take to the ocean, his chosen craft would not have been very controllable or fast. As long as he stayed afloat, he would have gone where the wind and ocean currents took him. He would have gone with the flow, confident that there was another distant shore awaiting them. To look in the right places for evidence of trans oceanic cultural influence, we need to understand the prevailing ocean currents and seasonal wind directions and how they may have influenced the movement of man across the oceans. Many modern scholars have, grossly underestimated the possibility of early man surviving at sea for a period of months. "1. A watertight hull is not the only, nor is it the best solution for security at sea. A wash-through raft made from Papyrus, Bamboo or Balsa cannot be swamped or holed and is very difficult to capsize. 2. Safety at sea does not increase with the size of the vessel nor with the height of its deck above sea level. Boats around 30 feet in length have a greater chance of survival at sea as they are able to move freely between and over swells without putting undue stress on the hull. Larger vessels tend to bury their bow and stern into surrounding waves, risking swamping, capsize and breaking amidships. 3. Hugging the coastline is far more dangerous than crossing the open ocean. Waves rising over shallow ground, being deflected off cliffs, tidal races, rock outcrops and reefs occur along coastlines, but not in the open ocean. 4. The logical conclusion that the distance from A to B equals the distance from B to A does not hold true at sea. Ocean currents and prevailing winds acting favourably on a slow moving raft can reduce the effective distance to 1/4 of the actual distance. For example, Thor Heyerdahl, in the Con-Tiki expedition when travelling the 4000 miles from Peru to the Tuamotus, only travelled 1000 miles of ocean surface. Conversely, if Thor had tried to sail back to Peru, he would have had to travel an effective distance of 7000 miles against the current. 5.When looking at a Mercator projection map, the straightline distance across the ocean is not necessarily the shortest distance. The world is a sphere and therefore the shortest distance between places is the great circle route. Interestingly the Kuroshio current of the North Pacific, follows the great circle route from Taiwan all the way to central America." 6. The necessity to store many months of provisions on a drifting craft is not necessary for survival, as a slow moving craft creates its own ecosystem on and beneath the hull. Seaweed, crabs and barnacles would provide birds and fish with food and the craft's rigging would provide a resting place for weary birds. The craft's shadow would also provide a place for small fish to hide from larger predators. Not only this, but fish and bird life back then would have been far more abundant. For the skilled hunter, the boat was in effect a floating larder. The Polynesian tradition of wearing a fishook pendant to ensure the wearer shall never go hungry, would certainly have held particular significance on these long oceanic voyages. Water would have been brought on board in either pottery or gourd water containers and if travelling in tropical regions, coconuts would also have been used. The isotonic fluids in the raw fish and seaweed would have provided supplementary fluid for survival between the occasional rainstorm. Once we have ascertained our physical environment and its limitations, the next step is to determine if there is any hard scientific evidence linking particular cultures at opposite ends of these "Rivers of the Ocean". Genetics seems to be able to show us, not only relationships between cultures, but how long ago there were such relationships. This is a powerful tool in determining the movements of early migrations around the planet. Geneticists, Manfred Kayser, Silke Brauer, Gunter Weiss, Peter A. Underhill, Lutz Rower, Wulf Schiefenhovel and Mark Stoneking: found that "Polynesians do share an ancient common ancestor with the Melanesians - individuals carrying the DYS390.3 deletion on the RPS4Y711T haplotype, shows the time back to the most recent common ancestor was estimated to be 11,500 years, but since then, they have evolved quite separately." S.W. Serjeantson "The Colonization of the Pacific, A Genetic Trail 1989; found that "HLA-B27 is totally absent from Eastern Polynesians, wheras it is common amongst Melanesians." Bing Su et al, University of Texas found that "the major Melanesian Y-chromosomal haplotype (H17, characterised by mutations at M4, M5 and M9) was not found in Polynesia." "HLA genes in Polynesia appear to show Asian rather than Melanesian origin. For example, a particular allele, HLA DRB1-0901, was observed at high frequency in Polynesians, a moderate frequency in mainland Asia, but was rare in Melanesian populations. There does appear to be some Melanesian/Polynesian admixture in areas such as Fiji, Tonga, Samoa and Polynesian outliers, but this has occurred less than 1,500 years ago. Although Polynesian genes are very similar to Taiwanese genes, the Taiwanese aboriginal people carried a different set of markers to either the Polynesians or the Micronesians, indicating a divergence and expansion in the populations about 6000 years ago. This is in perfect agreement with archaeological and linguistic data, which suggest that the Polynesians left the Taiwan area about 6,000 years ago, prior to mongoloid expansion. Reduced genetic diversity in Polynesians has also been reported for many other genetic markers, indicating two genetic bottlenecks, one 6000 years ago, with another one 2,200 years ago, which is associated with a rapid population growth – this is the time they arrived in Polynesia." S.W. Serjeantson "The Colonization of the Pacific, A Genetic Trail "HLA-Bw48 is commonly found in Polynesian populations, but is absent in Melanesia. The only other known population with an appreciable frequency of Bw48 is the Tlingit, Haida and Kwakuitl along the coast of Canada and Alaska. In Polynesia Bw48 co-occurs with A11." This indicates a variation since Polynesians departed Canada. Therefore it seems quite obvious that Proto-Polynesians spent 4000 years living along the coasts of Alaska and Canada, before arriving in Polynesia 2,200 years ago. Canada is the only region on the Pacific rim where tribes share the same cultural and technological characteristics as the Polynesians. Geographically, Hawaii is in a perfect position for recieving wayward travellers from Canada. Similarities in stone artifacts between Canada and Hawaii help confirm this connection. From these findings, there can be no doubt that the Kuroshio current played a big part in Polynesias pre-history, and that somewhere near to the island of Haida gwai'i, Canada, was the homeland of the Hawai'ians. The Ancient History of Hookumu Ka Lani & Hookumu Ka Honua by Solomon L.K. Peleioholani. "The ancestors of the Hawaiian race came not from the islands the South Pacific – for the immigrants from that direction were late arrivals there. – but from the northern direction (welau lani), that is, from the land of Kalonakikeke, now known as Alaska. According to this tradition, a great flood that occurred during the reign of Kahiko- Luamea on the continent of Ka-Houpo-o-Kane, (The Bosom of Kane) and carried away a floating log of wood named Konikonihia. On this log was a precious human cargo and it came to rest on the land of Kalonakikeke (Alaska). On this log was the first man and woman who came to Kalonakikeke from the continent of Ka-Houpo-o-Kane, they were Kalonakiko-ke ("Mr Alaska") and his wife Hoomoe-a-pule ("Woman of my dreams"). They were said to both be high chiefs of the countries of Kanaka-Hikina (person of the east) and Kanaka-Komohana (person of the west) and were descended from the great great ancestor Huka-ohialaka. 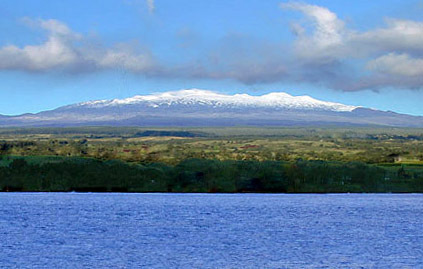 Many generations later, Chief Nuu, travelled with his wife, Lilinoe, their three sons and their three wives in a canoe called Ka-Waa-Halau-Alii-O-Ka-Moku (the royal canoe of the continent), and it rested apon Mauna Kea (white mountain), on the island of Hawaii.They were the first Hawaiians. According to Hawaiian genealogies, Chief Nuu lived approximately 2,200 years ago. His complete family tree lives on to this day in the chiefly families of Hawaii, such as the Kekoolani Family. Solomon L.K.Peleioholani was considered an important Hawaiian antiquarian, and the final word in Hawaiian genealogy, especially of the chiefs and royal familes. He was a High Chief, and in many ways both the pinnacle and terminus of the old royal blood lines from Maui, Oahu, Hawaii, and Kauai. His grandparents were among those who sided with Kamehameha the Conqueror to achieve unity of the islands. His father was an uncle to the Kings Kamehameha IV and Kamehameha V and he was himself one of the highest ranking chiefs in the Hawaiian Islands." Information kindly provided by “The Kekoolani Family Trust of Waipio Valley, Hamakua, Hawaii”. This vital historical information along with the above genetic data shows that Hawaii must have been the gateway into Polynesia and was the crucible where the essence of of Polynesian society was formed. down the Californian coast and eventually out to Hawaii. The Southern Equatorial Current flows out from Peru and Panama, directly into the the heart of Melanesia, bypassing most South Pacific islands. Also note that Hawaii and the Taiwan banks are at the same lattitude. According to some legends, the Hawaiians thought they had actually sailed back to Ka-Houpo-o-Kane only to find it had "drifted apart" during their 4,000 year absence. There is even a legend whereby they attempted to tow the islands back together. The Hawaiians were able to accurately plot lattitude from the stars, but had no way of determining longitude, therefore their belief that they were back in their ancestral homeland was a totally locical mistake. According to the above legend, the “Bosom of Kane” was another continent, and from there, they arrived in Alaska. 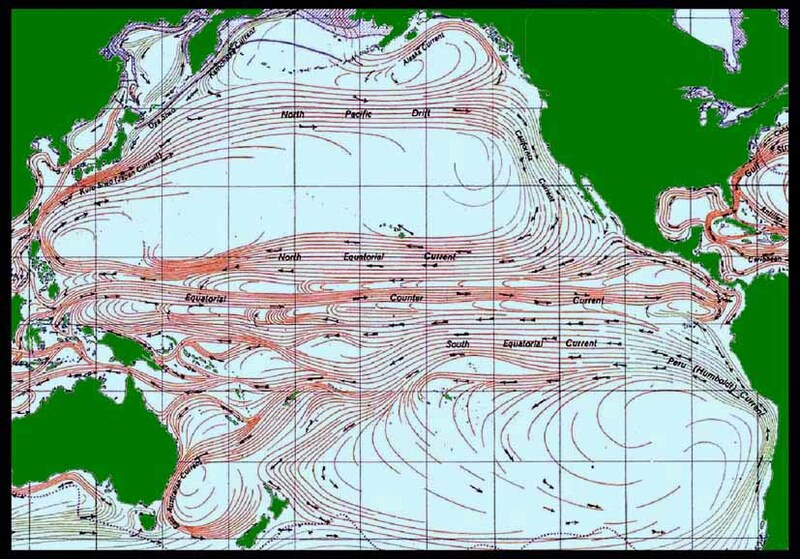 We must first look at the ocean currents of the North Pacific Ocean, which clearly shows the current which sweeps past Alaska, coming directly from the Taiwan area. Is it possible that they travelled all that way on a floating log of wood named Konikonihia ? The log could also infer the trunk of the family tree, (legends from S.E. Asia, often relate parts of the family tree to an actual tree). Bamboo rafts were a common means of transport around that time and are an alternative to the floating log of wood scenario. Both the Tlingit legend and the Hawaiian legend, appear to indicate that the significant gene pool arriving from over the western ocean was female. Both legends also indicate the male line was from Alaska. The specific name of chief Nuu is from both Hawaiian family genealogies as well as ancient Hawaiian historical stories. Although the language of the Nuu-cha-tha (Nootka) tribe of Vancouver Island is different today, there is possibly a cultural link between Chief Nuu and these people. Their arrival on Mauna Kea (white mountain) indicates they must have arrived in late winter or in spring time, to actually witness the snow. Chief Nuu and his family. The arrival in Hawaii would be something like this; as they approach the coast, below Mauna Kea, a large wave rears up from behind interrupting their singing, they start paddling frantically and the boat is picked up by a large wave and they surf towards the beach, the boat goes into a spectacular nose-dive and they end up in the surf. They clamber ashore unperturbed by their spectacular wipeout and are filled with the excitement of the occasion of arriving in a new land. Their joy overwhelms the scene. After many days of exploration, including hiking to the top of the volcano through the snow, they soon realize that the island has never seen humans prior to their arrival. They are in awe of the molten lava oozing across the landscape. The whole scene of nature is totally exhilarating. Iinquisitive fish swim up to their hands and they tickle their tummies. The birds fly down and land on their knees as if to welcome them to their new home. Flowers and giant leaves in the forest have them captivated. Dew on moss covered logs sparkles in the sun. They are in a garden of Eden. With only a small group as described in the legend, the sheer survival depended on rapid population growth, which is confirmed by genetics, therefore promiscuity was encouraged and was a critical part of their survival on these isolated islands. Sexually provocative dancing was developed, often resulting with the lead couple copulating on the dance floor. After 300 years the population on Hawaii was beginning to overflow and a desire to find new land became an important issue. 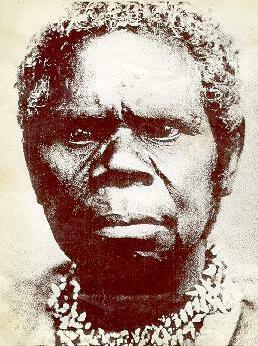 According to Dean Kekoolani's family genealogy, Queen Papa and Wakea lived around 150 –200A.D. Wakea and his wife Queen Papa began a quest of discovery spurred on by relationship troubles. Apparently Queen Papa caught Wakea with another woman, and so she left in a rage - with another man and they traveled by canoe to Molokai and started another family. A few years later, Wakea traveled to Molokai to see Queen Papa and they got back together. They left Molokai together and discovered Oahu and then Kauai. The legend of Maui-a-Kalana describes that 24 generations ago (around 800A.D.) Maui tried to tow the islands of Hawaii back together; Maui was out for an exhilarating sail to a neighbouring island. He is trolling and snags the bottom - with a strong tidal current running and with the stretch of the line, it appears that he is towing the island behind them. They quickly decide that it is an omen from the gods, and it is now their mission to tow the islands back together. Maui tells the others not to look back, as it would ruin the magic. One of the younger brothers is emptying the bailer, it catches on some seaweed, it is torn from his grip. the other brother sees the brown bailer and weed out of the corner of his eye and thinks it is the shoulder and hair of a wahine swimming. He inadvertently turns to take a second look. As soon as he looks back, the line breaks and he is admonished for ruining the magic. Maui had heard how their founding ancestors had once set off in search of their old homeland of “Ka-Haupo-o-Kane” from Alaska by following the latitude of Plaides - the lattitude of Taiwan and Yonaguni. As a result they ended up in Hawaii, which they assumed Hawaii was their old homeland and that had since broken up into islands. Little did they know they hadn't sailed far enough, they were a long way short of their intended destination. Their sureness that their homeland would be once again out of the water, was because in Alaska, over a period of 4,000 years they had observed dropping sealevels (rising land due to isostatic rebound), so they suspected that the floods had receded and that their homeland would be habitable once again. Therefore they assumed their homeland must have broken up and drifted apart. 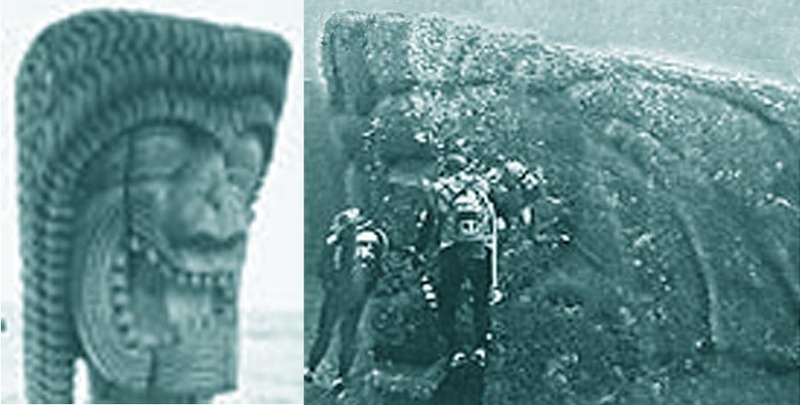 Hawaiian wood carving compared to megalithic monument, Yonaguni. 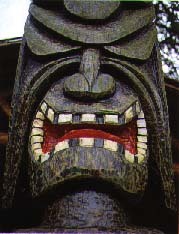 This Taiwanese carving on Yami island, appears to mirror the Hawaiian war god Ku. Is this traditional figure from ancient times, or is it the product of Hawaiian expansion in the 11th-13th centuries? By 600 A.D., The population was getting out of hand, as the policy of procreate, procreate, procreate was not appropriate anymore. The population was becoming a burden on the islands recources, so an exploration was mounted in search of new land. One group travelled south and made landfall on a 'Distant Land', they named this island 'Tawhiti' and they found nearby on Ra-ia-tea (Sun-people-white) a group of white people who worshipped the sun. on their return journey, in an effort to make as much ground to windward, so as not to miss Hawaii, they travelled North East and came across another group of low islands, which they called Tua-motu (back and off to the side-islands), their return journey was greeted with much jubilation and further voyages followed. Further exploration led them to Whiti (crossover - of a cultural kind), where they found a different breed of people with dark skin and frizzy hair. Tonga-tapu was the centre for battles between this cultural boundary and was called south-forbidden as a warning to venturesome seafarers. Further explorations led them to Ra-ro-tonga (Sun in the South), Ra-eva-vae and Ra-pa (Sun village) and eventually to Ra-pa-nui (Sun village big) where they met more sun Worshippers. 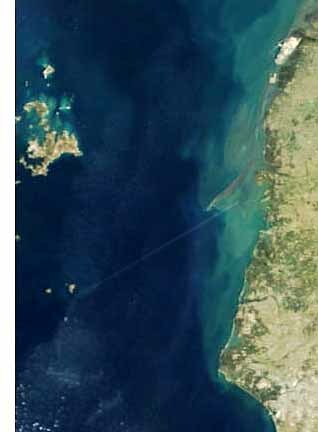 Rapa is almost directly opposite Alexandria in Egypt and could possibly hold some significance for ancient map makers and astronomers of ancient times. Raevavae is almost on the Tropic of Capricorn and therefore may also have been of some significance to ancient astronomers. As the Quechua language of Peru is 30% Austronesian, it is highly likely that the white skinned red heads from Peru spoke a similar language to the Hawaiians and therefore despite the Peruvian's adoption of the Egyptian sun worshipping religion, they both realised that they had a common connection in the distant past and were happy to assimilate with each other. Unfortunately the pale skinned red heads were mostly Rhesus negative, which proved fatal for all but the first born babies with a rhesus positive father - of which all the Hawaiians were. Not only this, but blonde/red hair and blue eyes are both recessive genes, therefore as time progressed fewer and fewer pale skinned red heads survived. Their affection for these people is seen in the tradition of brides hiding from the sun before their wedding day, so that their skin is as pale as possible. So why did the ancestral Polynesians leave the Taiwan area ~6000 years ago? We will notice from the graph below, the changing sea levels over the history of Homo sapiens. The sea level 6000 years ago was approximately 10 metres lower - the time that Polynesians were linguistically and genetically disconnected from Taiwan. According to genetic studies, they went through a genetic bottleneck. (a population crash or survival voyage). 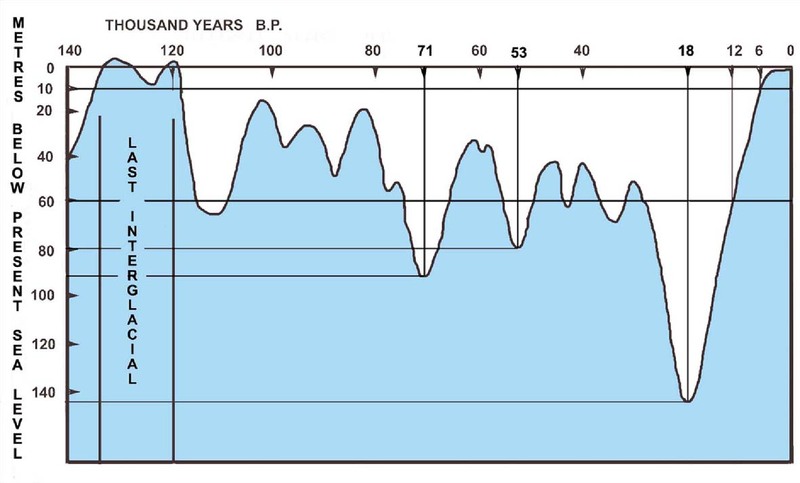 Rising sealevels have been a significant incentive for migrations.This graph indicates approximate fluctuations in sea level that Homo sapiens have had to deal with. The graph only applies to geologically stable areas unaffected by glaciation. Northern landmasses actually witness an apparent drop in sea level, as the land slowly “floats” up when the weight of ice sheets are removed. Areas near subduction zones, that are experiencing uplifting, such as New Guinea have experienced different fluctuations in sea level. The continental shelves depicted in turquoise in the map below would have mostly experienced sea level fluctuations as shown. Kuroshio Current, the most significant reason why Austronesian genes have appeared in many places along the coast of North and South America. The Turquoise area is between 30m and 140m and would have been habitable land 18,000 years ago. 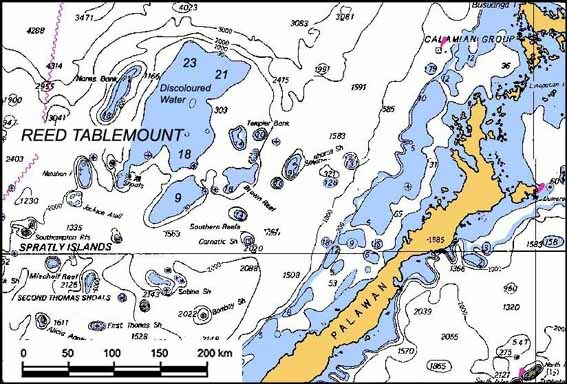 The yellow area is between 0 and 30 metres below sea level. And would have started disappearing under the waves about 9000 years ago. Just south of Taiwan, is a large area approximately 200 km by 90km and is approximately 8 metres below sea level. this would have disappeared under the waves approximately 6000 years ago. The Taiwan Banks would have been a large island capable of sustaining a unique culture such as the Polynesians for over 5,000 years. Taiwan Banks, possible 6000B.P. homeland of ancestral Polynesians. Red lines show the possible position of ancient causway linking Taiwan with China. 1. Eastern end of Ancient Causway with underwater ruins visible on northern end of Taiwan Banks. 2. 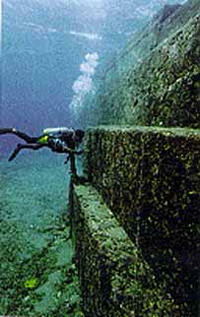 10,000 year old Underwater structures at Yonaguni-jima, near Okinawa. 3. 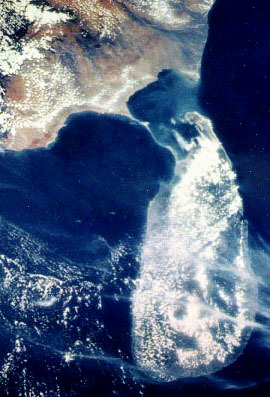 Ancient Causeway linking Sri Lanka with India. The great wall of China, although much more recent was obviously inspired by these earlier ambitious engineering projects. One can only speculate that the big flood mentioned in the Hawaiian legend that occurred on the bosom of Kane was a Typhoon associated with a storm surge that washed over the island, taking the remaining forest along with the inhabitants. Tsunamis from earthquakes as well as meteorite impacts in the Pacific must also be considered as a cause for the collapse of this significant civilization along the Eastern seaboard of Asia. The Taiwan Banks is not the only large island that has been lost to rising sea levels. 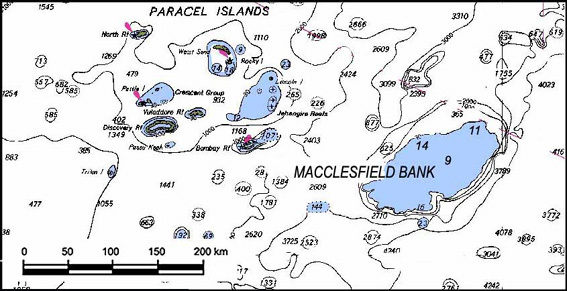 Macceslfield banks is approximately 9 m below sea level, and Reeds Tablemount is approximately 18 metres below sea level. under the waves about 7,000 years ago. this area would have dissappeared under the waves approximately 9000 years ago. It is also surrounded by currents leading into the Kuroshio current. By doing detailed studies of the rate of rise in sea levels, relating these to the time that these islands went underwater and comparing this information to observed genetic bottlenecks, these areas may possibly be chronologically matched up with other Asian gene pools at the other end of the Kuroshio current. For example; James L Guthrie notes that HLA B15 has its highest levels in Bali and Sumatra, the second highest levels are from the Paez speaking Warao and Atacama of South America.The Aymara speakers of South America have the third highest level. These genetic origins are possibly from as much as 10,000 years ago. The Cherokee, Paijanense of Peru and Quechua all have South and East Asian Origins. South East Asia was not the only place to experience rapidlt rising sea levels 6-8,000 year ago. the Bahama Banks was a significant island in the Caribbean, which with future archaeological studies may prove to be a dispersal point of a civilization that not only influenced Central American cultures, but also Celtic and Polynesian culture. 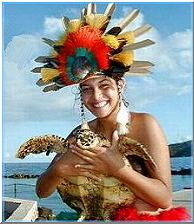 1.Tahitian woman with turtle. 2.Women of Huahine. 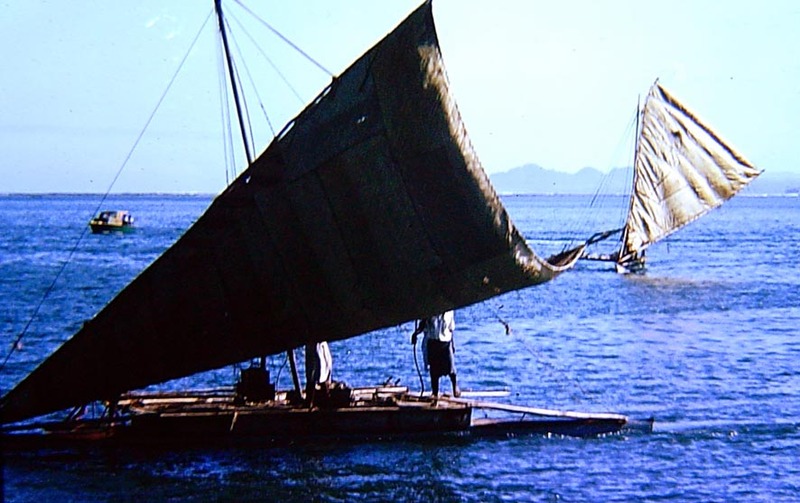 What is the Polynesian connection to the Legendary 'Sea People' of Tulapin? disappeared under the waves 8,000 years ago. It is now known as the Bahama Banks. Numerous floors, foundations and pavements still lie hidden under the shifting sands. 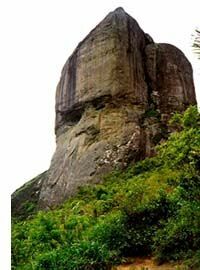 3.Gold/Copper alloy bust found in Venezuela. 4. 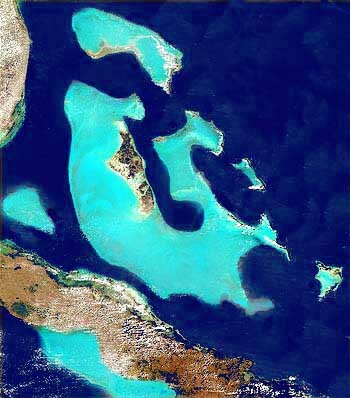 Bahama Banks, a very significant island 8,000years ago. Known as Turtle Island (Tulapin). Egyptian records from 5,500 years ago states that "The Turtle is Dead" a possible reference to catastrophic sinking of this island. Anasazi people speak of this island as their ancestral homeland. 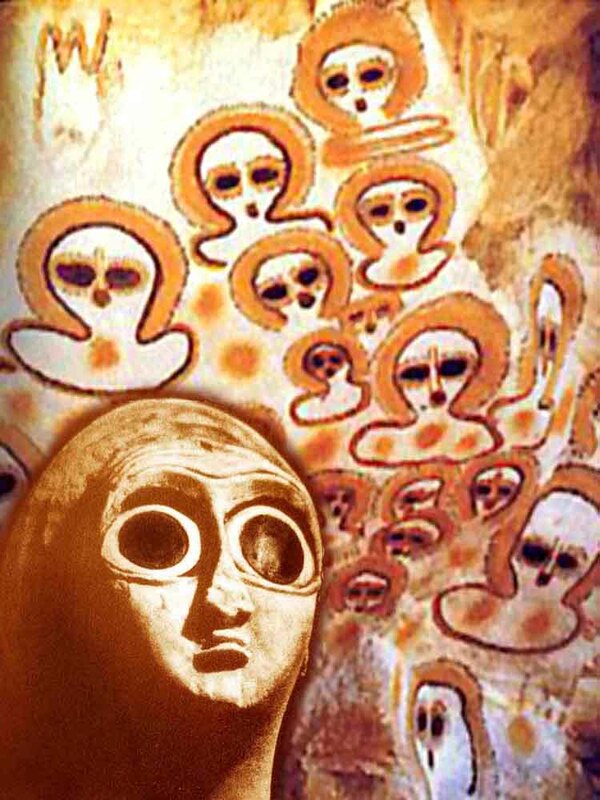 The Anasazi share many legends with the Celts and Basques. 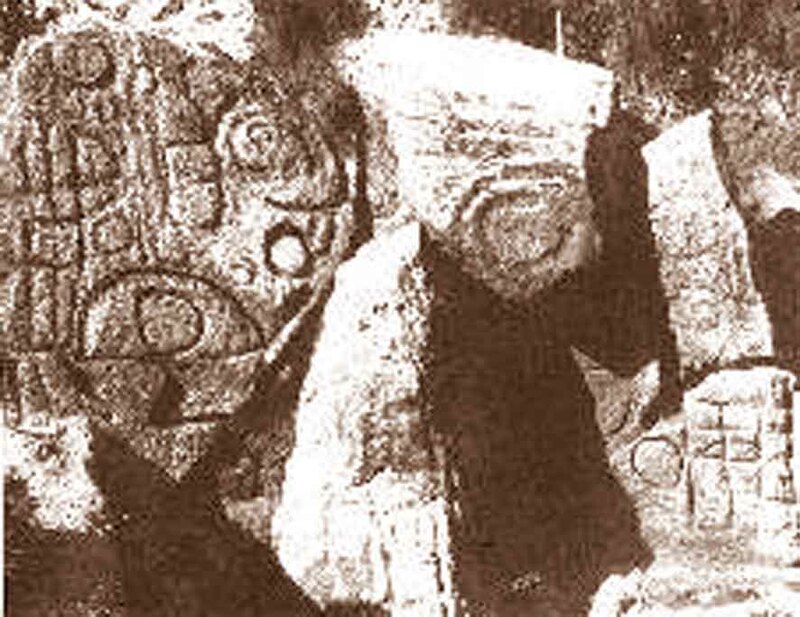 The Celts and Maori also share some cultural similarities that remain unexplained (spiral motif, dragon symbol and village fortification design). These Asian migrations to America are only part of the Pacific picture, as we will see in future chapters. The native American population is a product of many migrations over time, the most significant times of oceanic trade (periods of globalisation) were 12,000, 8,000, 4,000 , 3,000 and 1,000 years ago. It appears the Egyptians/Mesopotamians had a port at Gavea on the East coast of South America, they would travel up the Uruguay and Parana Rivers mining tin for bronze, silver and gold as well as trading for Cocaine which they brought back to Egypt. They left a trail of names prefixed with Ur, stretching across South America to Lake Titicaca. Some of these people, known as 'Children of the Sun' in South America, took the religion of Ra into the Pacific, where it manifested itself in island names such as the island of Ra'iatea (Sun people white) and the pyramid of Maha'iatea (Many people white). 1, Lord Anu, from; "The Genius of the Few" Christian O'Brien. 3. Wandjina images from the Kimberleys, West Australia. Superimposed is a statuette of Persian Lady Ninkharsag. The white skin, frizzy red hair and small mouths are very intriguing, the large eyes are also an enigma. Large eyes are usually the product of living in low light conditions. Is there a connection between these people and the people who once inhabited the massive subterranean cavern systems found in Turkey and Malta? What were they hiding from? Meteor bombardments? Meteoric Iridium and volcanic ash in Greenland and Antarctic ice cores from 11 - 20,000 years ago does seem to suggest an anusually large amount of impacts during this period. 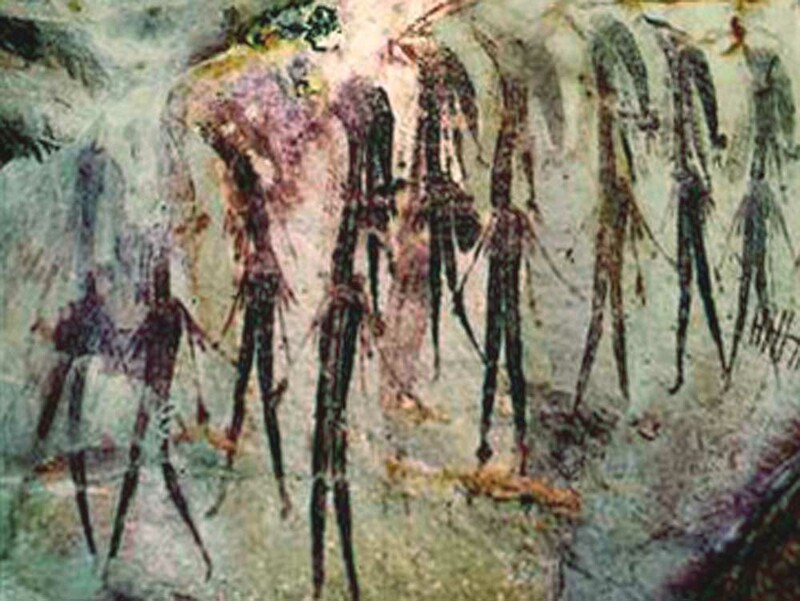 Gwion Gwion or Bradshaw paintings from over 17,000 years ago in the Kimberlies, depicting the 'dance of the 9 maidens'. 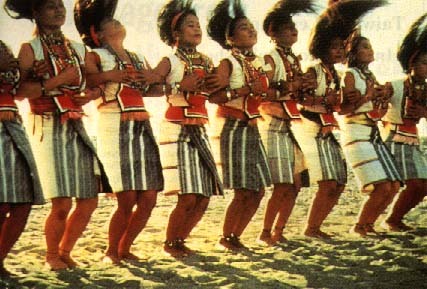 On Yami island, south of Taiwan is the same dance being performed today, suggesting that both these people have strong cultural connection through a parent (seafaring) civilization in the distant past.Gwion Gwion paintings also depict high prowed (ocean going) boats carrying 30 people confirming their seafaring ability 20,000 years ago. The fact that Egyptians took home the boomerang as a souvenir also indicates the extent of their travels. Papyrus in Cape York, the Indian Lotus flower across the swamps of the north and the Baobab tree are all believed to be evidence of these ancient voyagers visiting the shores of Australia in ancient times. Clovis style spear points and ancient forts have also been found along the Southern coast of Western Australia. Phoenician petroglyphs have been found in Tasmania and South Australia. Egyptian Scarab beetle carvings and bronze axe heads have been found in the Blue mountains, and there is a Phoenician wharf in Sarina made of smelter slag. 1. 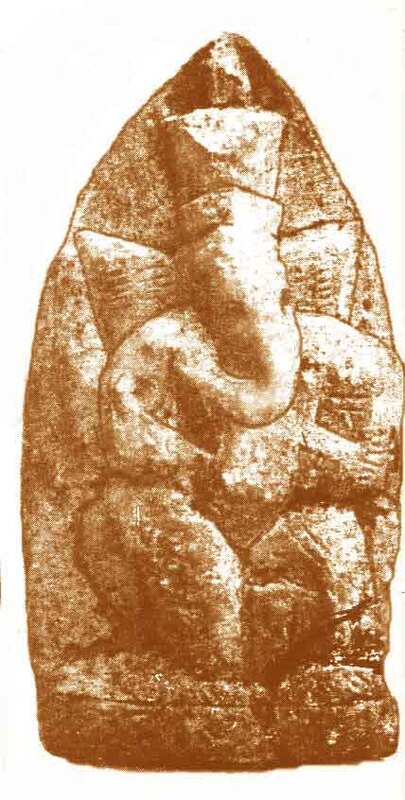 Hindu elephant god, found near Toowoomba, similar ones have also been found in Central America. 2. 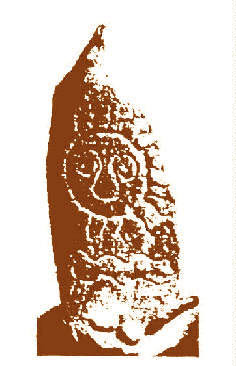 Wandgina figure from the Kimberlies with Phoenician writing on the turban. 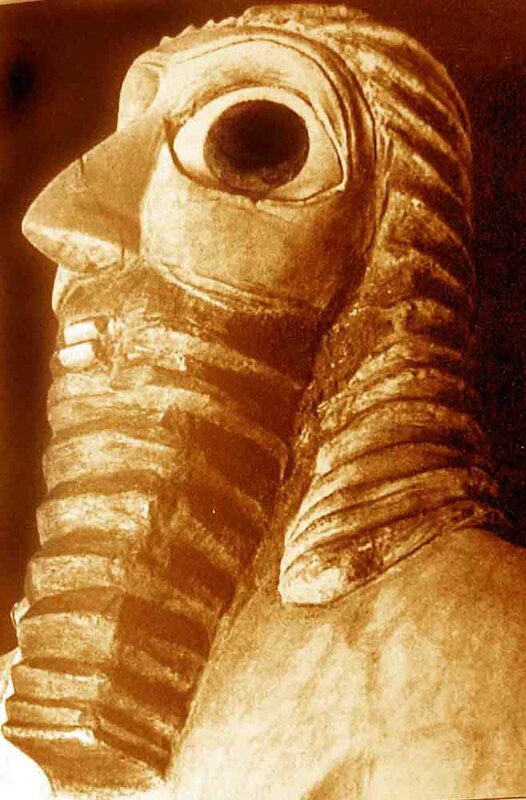 The white face and red robe depicts what were known as 'The Shining Ones' in Hebrew scripts, the people who brought science to the Sumerians 10,000 years ago to begin western civilization as we know it today. 3. 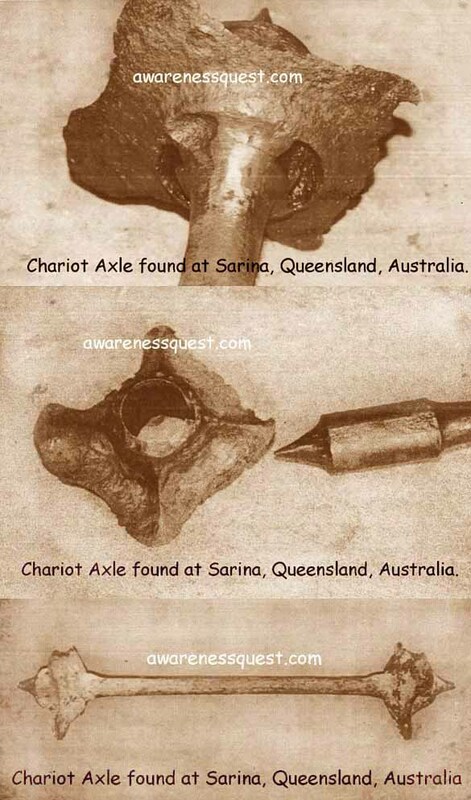 Bronze Chariot axle, Sarina Qld. 4. 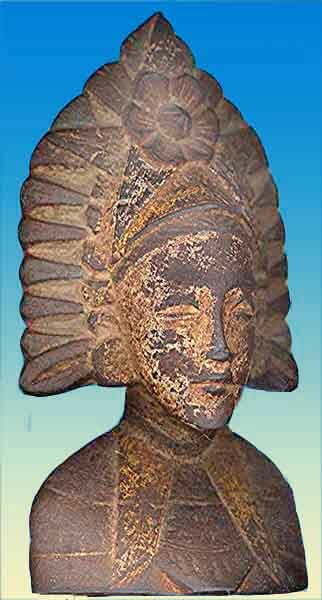 Hopi sun god, excavated in Toowoomba believed to be from the La Tolita - pre-Mayan culture from 4,000 years ago. 1. 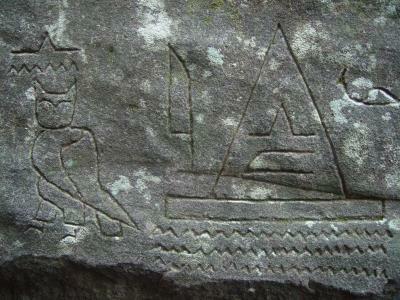 Egyptian heiroglyphics, Western Tasmania, the home of the taller semitic Aborigines of the island. 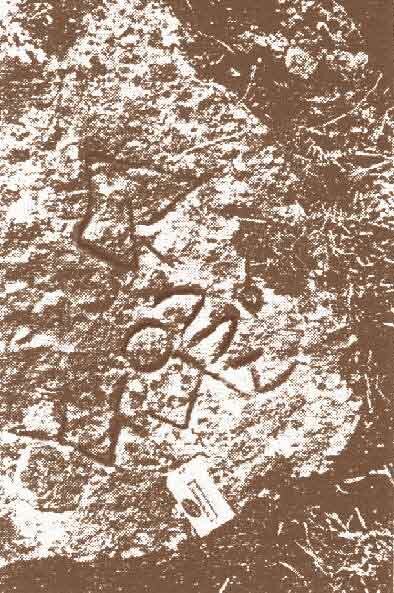 2.Phoenician writing, South Australia. It reads, "Men of the Pharaoh of the city of Sais. Ot of Kish." Ot was a famous Egyptian navigator. 3,4,5. 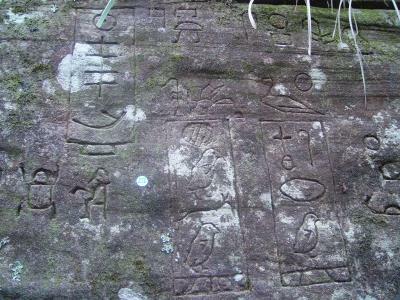 Egyptian heiroglyphics found near Gosford, Australia. Apparently it tells of an exploratory voyage, where their ship was damaged and their leader died of a snake bite. 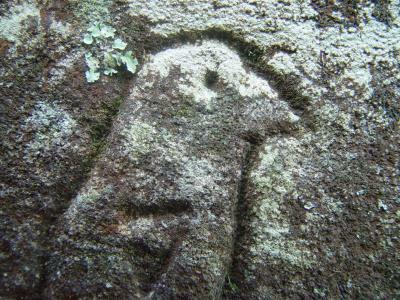 Although some petroglyphs have been re-carved by misguided individuals in recent times, signatures of the carver, such as the squiggle protruding from the top of the beak (above) are in keeping with 4th dynasty tradition, confirming their authenticity. from the 4th Dynasty between 2,800-2250BC. Kufu was known to have encouraged extensive seafaring. Photos by Tom Walter. More recently, in the year 232 BC, Captain Rata and Navigator Maui set sail from Alexandria to circumnavigate the globe using a Tanawa or Torquetum to measure latitude and longitude using the moon as a reference point. Visiting Pitcairn Island, they left petroglyphs indicating they had viewed a lunar eclipse whilst on the island. (History almost repeated itself when Captain Cook stopped in Tahiti to view the transit of Venus across the sun). In New Guinea, they left a petroglyph depicting the Tanawa as proof of their passage. Also confirming their passage through the Pacific, the Maori of New Zealand attribute the discovery of New Zealand to Maui. Rata also features in Maori legend as a man who ventured into the Pacific on a vengeful mission in search of his father's killer. Interestingly, although the Maori have lost the knowledge of the operation of the Tanawa through the mists of time, they still believe possession of a Taniwha will ensure the safe passage across the ocean. The Taniwha is depicted as a dragon, hinting at the religion or clan that Maui belonged to. It would seem from this information that the Maori of the central Pacific knew of the location of New Zealand for over a thousand years but only chose to colonize it fully when wars in the central Pacific one thousand years ago, forced them to leave their tropical paradise. Other wayward voyagers to Australia and New Zealand could have been from people arriving by the Easterly flowing Current across the Indian ocean from Southern Africa, pushed by the Westerly winds, coming ashore along the southern coast of Australia Tasmania and New Zealand. Similar to the Dutch East India Company ships that came to grief along the Australian coastline, because they underestimated their speed across the Indian Ocean. Apparently there was a tribe living near Palm Valley with blonde hair and Dutch names, they were shot by the English colonials, fearing a Dutch claim for sovereignty. In Victoria there are remains of stone buildings similar to Phoenician dwellings. The Egyptians were not the first foreigners to visit Australia. Clovis style spear points have been found on the Nullarbor, Stone monuments set up for observing the summer/winter solstice (similar to Stone Henge) have also been found in South Australia. There is even an ancient fort on the coastline East of Esperance. 10,000 year old petroglyphs have been found in the Flinders ranges, Australia. They are similar in design to other petroglyphs of a similar age found throughout the world and probably represent one of the most ancient writing systems. They have a striking similarity to ones found in underwater caves in the Carribean as well as in America. 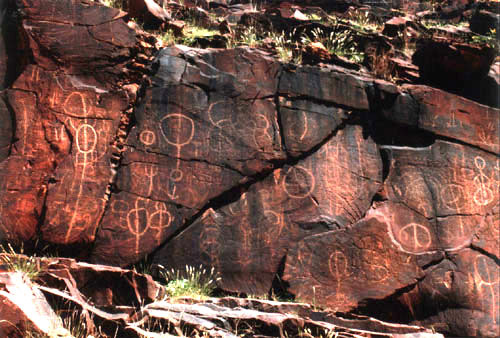 Petroglyphs in the Flinders Ranges, South Australia and Petroglyphs in North America. 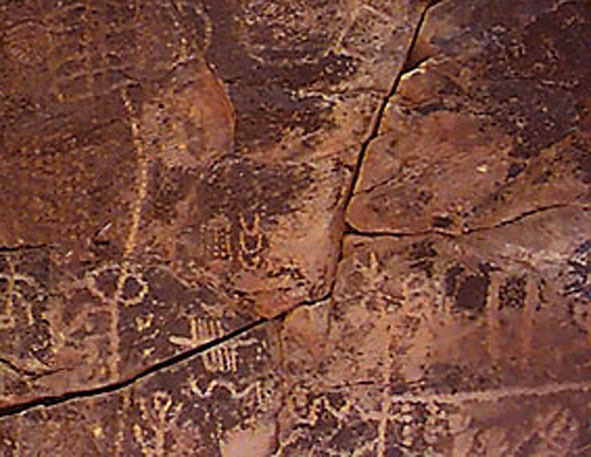 These petroglyphs are both thought to be over 10,000 years old and could well have been drawn by people of the same language. There are two possibilities, the first is that the Veda/Anu (early aborigines), once spoke the same language and used the same writing system as Cro Magnon man, the second is that the Clovis/Solutrean people explored the whole world, including Australia. It has always been an enigma why Tasmanian Aboriginals were different in looks and culture to mainland Aborigines, more than this there were two distinct groups in Tasmania - Truganinni's tribe were a mix of Negritos with Aborigines from one of the earliest migrations to Australia 60,000 - 100,000 years ago, but on the Western side of the island there were a much taller people, they used papyrus rafts and were more semitic in looks, similar to the Chatham islanders of New Zealand. These people lived near a place where Egyptian inscriptions were found. Unfortunately the English colonials killed every Tasmanian, so genetic data cannot be analysed. by heartless Christian colonists after they had raped her. This article further proves that people did have the technology for voyaging the oceans over 7,000 years ago. A BRITISH team of archaeologists believes that small slabs of bitumen dug up in Kuwait could hold evidence that man was building ocean-going boats over 7,000 years ago. The bitumen pieces, dating from 5,000BC, are indented on one side by impressions of reeds and encrusted with barnacles on the other. The team, led by Robert Carter, from University College London, made the discovery while unearthing a Neolithic human settlement at Subiya, on the northern shore of Kuwait Bay, at the top of the Gulf. The team, which included archaeology experts from Cambridge and York universities, said what made the dig particularly exciting had been the discovery of a model boat from the same period. “It has a surprising amount of detail on it, telling us a lot about how this community constructed its boats. There are lines coming down from the prow and the stern, which may be junctions of reed bundles, or ropes, and it's got two indentations for wood to be laid across it,” Dr Carter said. Before the days of the train and motor vehicle, ships were an immensly important vehicle by which trade was carried out between cultures. The rivers of the ocean were their highways. Ancient writings state that there were 12 main rivers of the ocean. In the Atlantic Ocean flowing West; (1) the Southern equatorial current, (2) the northern Equarorial current, (3) the East Greenland Current. Flowing East (4) the Gulf stream, (5) the south Atlantic westerly current. In the Indian Ocean flowing West; (6) the Southern Equatorial current, (7) the Southern Ocean Westerly current. In the Pacific Ocean flowing West; (10) the Southern Equatorial current, (11) the Northern Equatorial current. 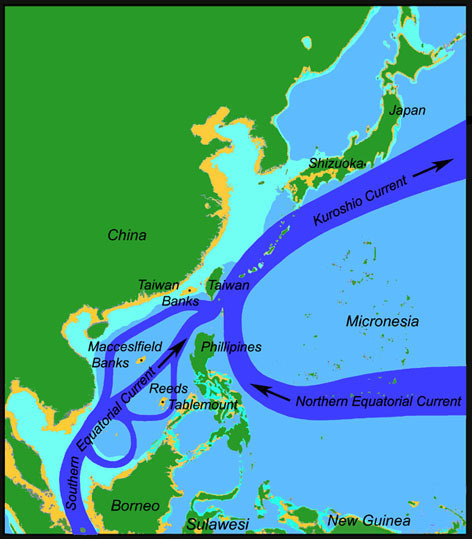 Flowing East; (12) the Kuroshio Current. The Bering land bridge theory was such a simple concept, unfortunately it was not logical - Who would want to go so far north during the height of an ice age? I am sure a relaxing voyage, in the tropics, with the wind behind you and the occasional stop off at a tropical island paradise would have been a far more attractive alternative. It would be nice if human movement around the planet was simple, straight forward, with no return journeys and they did not enter the water, but it was not so. It appears that the fear Europeans had of falling off the edge of the earth was a recent myth, generated by the church in Europe during the middle ages. Early man certainly had "No Fear" of the Ocean and took full advantage of the trade opportunities it had to offer. The Pacific, although a little more isolated from the rest of the world was at times included in this world trade network which stretched from Portugal, through the Caribbean and into the heart of Melanesia and can be seen from the evidence left by the Obsidian traders and Lapita potters, between 4,000 and 2,800 years ago. We will cover this in the chapter on Lapita pottery.